← Sunshine to the NFL! Yes, I made that 'greater than' arrow using Bitmap Paint. so what. Finally, the SDSU Aztecs are getting some national pub. This week’s Sports Illustrated is hitting the stands and there a great write-up on the Madhouse on the Mesa. You can read it here. We can’t take credit for the entire article… but we can for one paragraph: The Show. Our favorite SDSU hooligans got a shout-out in the article. San Diego State has sold out 13 games at Viejas, compared with eight in the previous 13 years. The students have camped out to claim their one allotted free ticket—even for games against lowly Mountain West foes TCU and Wyoming. When No. 7 BYU comes to town for a nationally televised game on Saturday, the line will again form the night before. Those who get one of the precious 2,500 ducats become part of the Show, which is rapidly eclipsing all student sections in volume and randomness. At the appropriate time, several dozen students in the front rows along one baseline—their costumed numbers usually include a banana, an elf, a gecko and what appears to be an escapee from the ’80s band Devo—hold up giant cutout heads of the likes of David Hasselhoff, Justin Bieber, Woody from Toy Story, Miley Cyrus and assorted others (is that Kim Jong-il?) with the goal of distracting a free throw shooting opponent with B-list celebrity overload. Did we mention that they are also really, really loud? A well-traveled ref working a recent Aztecs home game told the coaching staff that the only arena environment that compares with San Diego State’s right now is Kansas’s. Clearly, Sports Illustrated read our article on The Show, realized how awesome they were, and ran with it. It’s cool. We know…and that’s what matters. Not to split hairs or anything, but, “what appears to be an escapee from the ’80s band Devo”? Clearly SI’s Kelli Anderson is not a fan of the Beastie Boys’ Intergalactic Planetary. Congrats to The Show for the national attention. WE WANT JIMMER! Oh, I almost forgot…speaking of Jimmer… The Show got his girlfriends Facebook page, and everybody started to “poke” her. She closed down her page because of it. They also had these tshirts made. 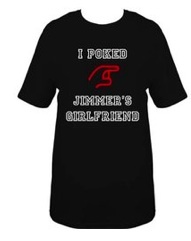 “I POKED Jimmer’s Girlfriend” You can read the story about it here. I know you’re walking a fine line when you’re poking fun at another religion (pun totally intended), but this is clearly done in good fun. Pretty freakin’ funny. School officials say the school won’t let anybody wearing the shirt into the arena. Ha! I got $100 bucks that says we’ll see someone from The Show wearing it on Saturday morning. This entry was posted in Basketball, NCAABB, News and tagged Aztecs, Beastie Boys, DJ Gay, I poked Jimmer's Girlfriend, Kelli Anderson, Madhouse on the Mesa, SDSU, SI, Sports Illustrated, Steve Fisher, The Show. Bookmark the permalink.